One of the most rewarding things about knitting for friends is seeing them enjoy what you've made. It's always been my contention that what you make is to be used and not "put away for good". Use them hard and put them away...faded! That's my belief. You may remember that I was knitting the Jigsaw Afghan. 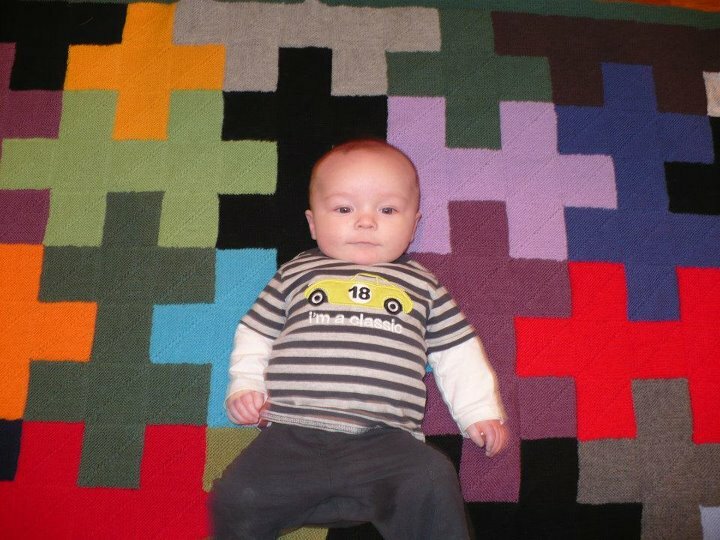 It was a gift for a good friend who is a new grandma to a darling little boy named Ellis. Today I was sent a picture of Ellis on the blanket. What a cutie, he is. I'm glad that I finished the afghan before he entered high school! By they way, there is a Ravelry knitalong for the Jigsaw afghan here. One of these days I'm going to get to that Jigsaw pattern. It's just too gorgeous not to knit, especially when you can put a cute baby on it! The afghan turned out great and what a cutie!